Casting Instruction - Website of flyfishingwithtom! The Guides' Lament: Why Can't They Cast? Getting started right will put you years ahead. Learning difficulty is proportional to time spent reinforcing mistakes. Learning and practicing the right stuff will rapidly advance your skills, safety, and pleasure. Old hands who didn't learn properly are like those who never forgot how to fall off a bicycle. Some anglers simply want to advance their skills or learn new hat tricks. We have fun with all of them. Really! We love seeing the lights click on as people "get it." Readers: if you weren't one, you wouldn't be this far. You can learn much about fly fishing by reading or watching videos. However, they can't watch you cast to see what you're actually doing. We can, and we can quickly help you fix the problems. No problems? We can teach you some new tricks. It took about a decade to learn what NOT to teach, and we have. 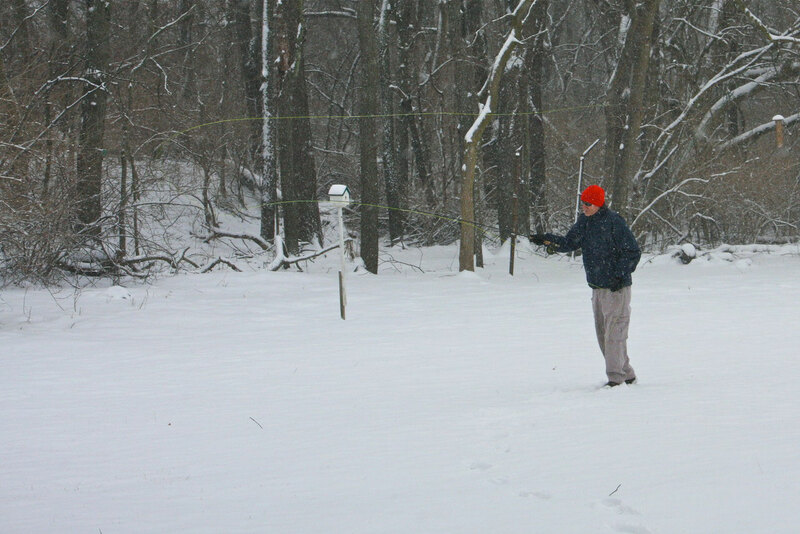 Introduction to Fly Fishing -- a special "show & tell" for groups interested in fly fishing. Beginning Class -- Learn the basic skills of fly casting using our equipment to see what gear works best for you before you invest in any. We allow four hours total time for the basic instruction. Cost varies with class size, with no more than six students per instructor. Personal instruction is available. Advanced Instruction I -- Build on basic skills to improve distance, accuracy and working with the wind. Excellent training for casting more powerful rods & big flies. Base class fee: $50 per student. Cost varies with time, location and number of students. Individual instruction available at $50 per hour. Advanced Instruction II -- Finesse skills. Slack line techniques, drag management, curve casts, wind work, specialized casts for nymphing, streamer, and dry fly presentation. Casting in confined spaces. On-stream class recommended (see below). Base cost $50 per student. Cost varies with time, location, and number of students. Individual instruction available at $50 per hour. Still water techniques -- Learn techniques for sight fishing, structure fishing, sinking lines, fly action, management of fly line, and working with a guide. Stream fishing techniques -- on a well-stocked private stream. Learn proper presentation of nymphs, wet flies, emergers, streamers, and dry flies. Wading technique, reading the water, fly selection, rigging, and how to manage fish. Contact us for cost and availability. Pricing -- Costs vary depending on instruction, time, location and number of students. 1) We are not currently identified as your spouse, parent, lover, paramour, or primary care physician. 2) We know what we're doing. 3) We'll know what you're doing -- both right, and wrong. 4) We know how to make it easier, more effective, and more fun.